From the time that I was small, I always had an artistic streak. I never pursued the arts in any form other than as an on-again, off-again self-taught hobby not because I wasn’t interested but more because I didn’t have time to fully commit. I had too many other irons in the fire that took priority. I can honestly say I have no regrets about that, but now it is time to go back and stoke those artistic embers. In our home ceramics studio, Chuck is often busy throwing new pieces which I will later glaze. And, while he is busy creating in clay, I have started oil painting. Chuck will often start by throwing cat bowls. It is a quick and enjoyable warm-up to other things. Following his lead, I have started painting cats. I love felines and figure cats can be an enjoyable warm-up for me too! Recently I came across a photo sent to me by a past custom cat bowl client. She had requested a custom order that included a sketch of her cat on the bowl so she sent me a variety of photos to choose from. We ultimately went with a design of BG (aka Baby Girl) curled up asleep glazed on to the bottom of the bowl. The shape just seemed to suit the bowl. But one of the other photos she sent (shown in this past Customer Cat Tales post) always made me smile. It seemed like the perfect model for an oil painting so I gave it a whirl. Below is BG immortalized in oils. She still makes me smile! I am genuinely considering offering a set in our Etsy shop that includes a painting of a customer’s cat to accompany the personalized bowl. What do you think? If you are interested, visit our Etsy shop – CatTail Studio Arts – where you can send me a conversation. I would love to hear from you and maybe we can make your furry friend into a work of art too! On a recent weekend, I was called into San Francisco to measure an apartment for my day job as a kitchen and bath designer. It can be a bit of a slog to make that drive into the city from our home. It is far enough that I don’t really want to drive there and back on the same day through the week so, in order to make it more fun all around, Chuck came along and we mixed a little business with pleasure by going to a few sites we had always wanted to visit but had never made the time for, until now. Two such venues were finding the Yoda fountain at Lucasfilm and exploring the Walt Disney Family Museum, both on the grounds of the Presidio National Park. 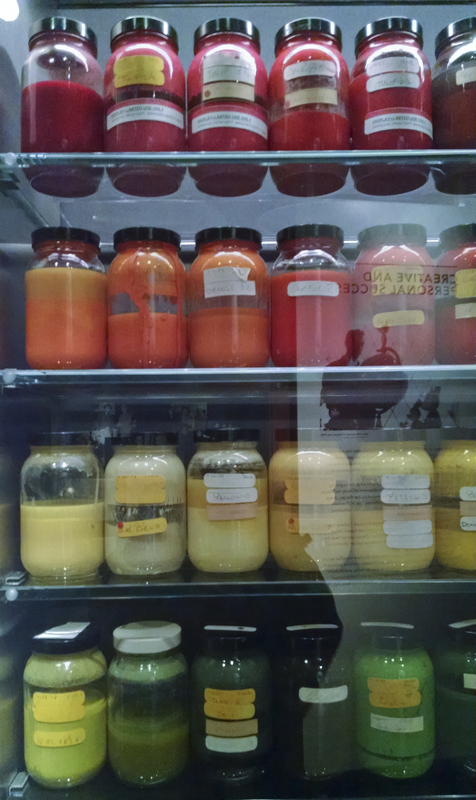 You might wonder why there would be a film studio and a film museum inside a national park?! As mentioned in an earlier post, the Presidio is an interesting innovative experiment where the National Park Service has partnered with the Presidio Trust and the Golden Gate National Parks Conservancy to find ways to operate the park and fund the upkeep of the old military history and facilities without spending taxpayer dollars. As a result, they have been leasing former military residences as residential homes, leasing hospital and warehouse structures as commercial workspaces, and operating hotels, a golf course, a campground and other venues for something like twenty years. Earlier this decade, they turned the corner on the project and it is now widely considered to be a huge innovative success in collaboration. The benefit for you and I is that there is a beautiful park on the shores of San Francisco Bay with loads of interesting things to do with the family that is self-sustaining. But I digress. Back to our adventure. 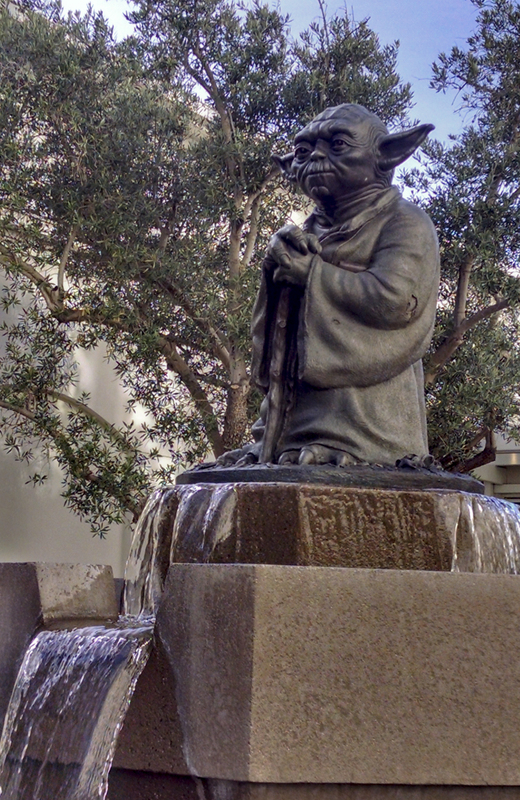 We walked from our motel to the Presidio park complex and, in short order, found the Yoda fountain. It is one of those off the beaten path, hidden gems you can go searching for the next time you are in San Francisco. Whether you are a Star Wars fan or not, it is rather fun to find so I am not going to tell you exactly where it is aside from the fact that it is in the Presidio on the Lucasfilm complex. Here is what you are looking for. Happy hunting! May the force be with you! Next we wandered over to the Walt Disney Family Museum. To be honest, I was expecting a collection of Disney marketing much like walking through the shops at Disneyworld (my cynicism was showing) but was very pleasantly surprised to find a sophisticated and well-curated museum that got into Walt Disney’s upbringing, his role in innovating animation and technicolor, and the growth of his vision over time that consistently revolved around providing quality entertainment for the whole family. Who knew he got his start in business making jelly in Chicago?! On the day we were there, there was a bonus exhibit of the artwork of Eyvind Earle, the lead stylist for the ‘”Sleeping Beauty” movie in 1959, as well as an exhibit showing life with Walt and his trains during the holidays at his home in California. Those may not be there when you are in town, but there is always a little something extra to take in whenever you do arrive. Next time you have a bit of business to do in San Francisco take a couple of hours to mix in a little pleasure at the venues on the Presidio. They are worth the visit with or without the kids in tow. Some of you may recognize the title of this post as a quote made famous by Liberace – one of Las Vegas’ greatest showmen of all time. Earlier this week, Chuck and I watched the HBO movie, “Behind the Candelabra”, about the life of Liberace behind all the outlandish costuming and showmanship. I was in awe of Michael Douglas’ performance as Liberace. If you haven’t seen the movie, it is worth a view. The film got me to thinking about a past foray to Las Vegas, Nevada – a town that has the fine art of showmanship mastered! We were only in town for a couple of days but consider ourselves lucky that it occurred during the six weeks when the Liberace Exhibit was on display at the Cosmopolitan. At the time, this was the only way to see any of the memorabilia as the Liberace Museum closed in 2010 and hasn’t reopened. The exhibit was billed as Liberace’s ‘return to the strip’ and it was wonderfully displayed in the windows of the Cosmopolitan. 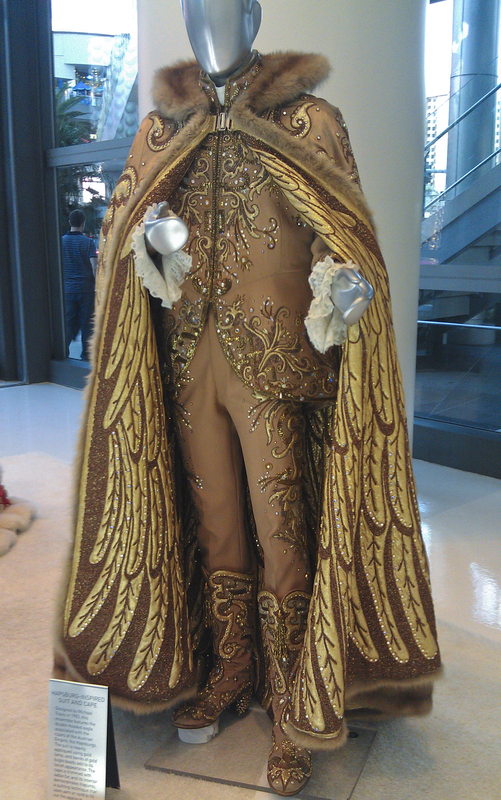 Seeing his costumes up close and personal were phenomenal with the details of the stitching and the careful placement of thousands of rhinestones, both inside and out on his over garments. With all that adornment, one of the capes weighed over 80 pounds! Having backpacked a few times in my life with a 35 pound pack on my back, I still find it amazing that this guy performed with the equivalent of two and half packs draped over his shoulders. What the guy wouldn’t do for the show! I remember seeing Liberace on television when I was little. I can’t recall if my parents were fans or not, and I was too young to care, but I do remember seeing him drive out on stage in a car covered in rhinestones and play a piano all covered with rhinestones with a glitzy candelabra on top. It was a spectacle and it made an impression even to a five-year-old. 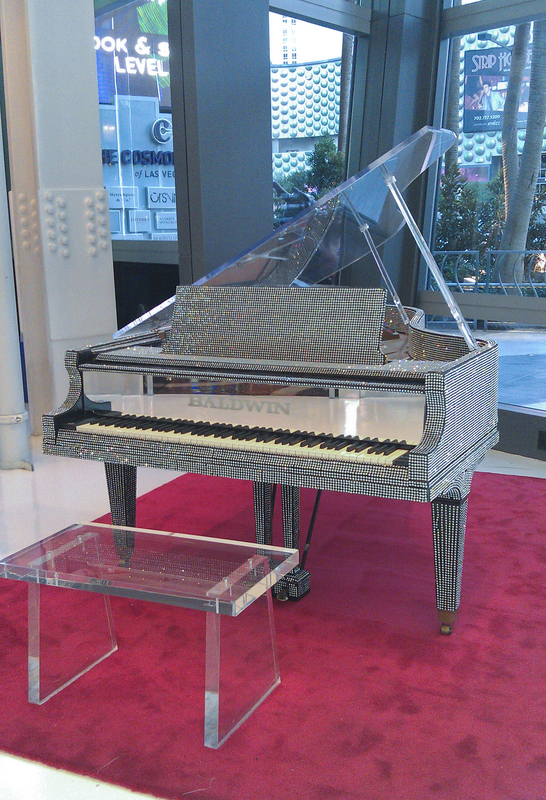 Upon walking through the casino doors at the Cosmopolitan, the rhinestone studded car was sitting there to great you and the piano was right around the corner. Again, what showmanship! While I haven’t been back to Vegas in the past two years, I did recently read that the Liberace cars are now viewable again at The Liberace Garage for to price of a $14 ticket. As for those incredible costumes, they are available for you to see if you sign up for an exclusive, private, guided visit to see The Liberace Museum Collection. As I understand it, for roughly $130 per person, they will pick you up from your hotel on the Las Vegas Strip and take you to the venue where you are served a light champagne lunch at Michael Jackson’s Thriller Villa and given a tour of the memorabilia. Liberace has long left us but his showmanship lives on!